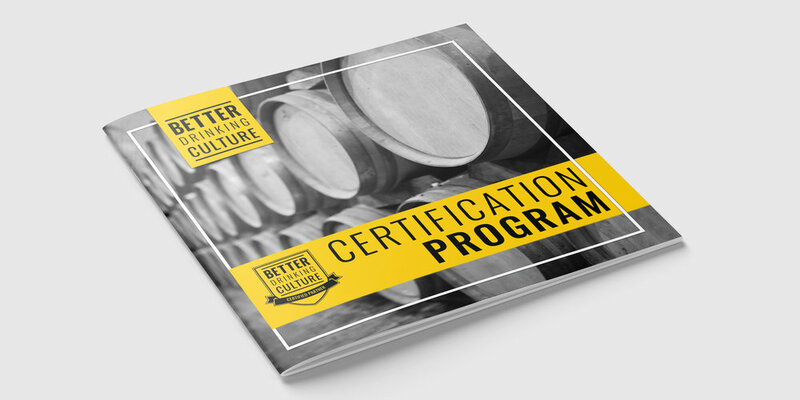 The BDC Certification Program recognizes and distinguishes breweries, distilleries, cideries, wineries, brewpubs, bars, and restaurants that are actively contributing to a better drinking culture in their community. Whether you're a startup operation or an established destination, this growing national network of Certified Partners gains access to a growing tribe of BDC members who desire to drink and eat at establishments that care about their health, safety, and well-being. "BDC Certification attracts a more educated, higher-end, and longer-term consumer." - Joel Petersen, VP Marketing, New Holland Brewing Co.
Our culture is booze-enthused, and it’s leading to physical, emotional, societal, familial, and mental health issues. We at BDC decided to take our movement to the core of the industry by partnering with establishments like you. There are few things better than enjoying a hand-crafted beer, cocktail, or drink over engaging conversation with good people. As a member of the industry, you understand and appreciate how important it is to respect the craft, and enjoy quality over quantity. We're enlisting your help, and invite you to join BDC on the journey to elevate the drinking experience by helping propel positive cultural change. TO YOU: To recognize and distinguish a community of alcohol producers and on-premise establishments that put the health and safety of their customers first. YOUR CONSUMERS: To empower consumers to drink better and live healthier by reducing the cultural and peer influences of over-consumption and alcohol abuse. YOUR COMMUNITY: To build and sustain a better drinking culture in your community by reducing the abuse of alcohol through means of education, example, and influence. A better drinking culture helps communities thrive by making them better places to live, work, and raise families. Communities with lower alcohol abuse tend to have lower levels of crime, violence, and attract a stronger, more vibrant workforce. YOUR INDUSTRY: A better drinking culture protects the alcohol industry from higher liability costs and future increased regulations by reducing the abuse of alcohol in your establishment and community. As we shift the drinking culture in a healthier direction, we reduce the need to pursue stronger regulation oversight, increase alcohol related taxes, and unnecessary government restrictions. Choose your certification path by answering a brief assessment that qualifies you for either Fast Track Certification (3 levels) or Full Track Certification, which includes a comprehensive audit and evaluation. Recommendation to change any "Drink Responsibly" verbiage on your website, menus, packaged products to "Drink Better"
While there is no cost to apply for Fast Track Certification, BDC requires a modest monthly contribution based on a producer’s annual barrel production, or a bar/restaurant’s annual alcohol sales. Certification Fee applies the same to either Fast Track or Full Track Certification, and can be accessed further below. *Drink Maximum policy disclaimer: The law, a person’s safety and health, and your establishment’s policies take precedence over BDC’s recommended Drink Maximum. Management and service staff are to always use their professional discretion and best judgement regarding all situations, and expected to take into consideration intoxication rate factors that affect a person, the type of beverage, its strength, and its serving size. We don’t have to tell you that a person’s safety should be your first priority, and that serving alcohol to someone who’s intoxicated is against the law. BDC will conduct a comprehensive audit of your establishment on your use of industry-wide best practices, and score you. We’ll craft a personal summary of our findings, unique to you, which includes suggestions to improve operational, marketing, and company policies and procedures. Note: This audit and summary of findings are kept confidential, and not shared with anyone outside of your organization. WHAT ARE ESTABLISHMENTS EVALUATED ON? Full Track Certification requires a one-time fee for BDC to score the comprehensive audit, and, upon passing with a minimum score of 70% (with one opportunity for improvement included), a minimum of 1 BDC Ambassador trained, and the monthly Certification fee. BDC’s Certification Program requires a monthly contribution to forward BDC’s education initiatives, and to support Program resources. Certification Fee is based on a producer’s annual barrel production, or a bar/restaurant’s annual alcohol sales. Certification Fee applies the same to either Fast Track or Full Track Certification. 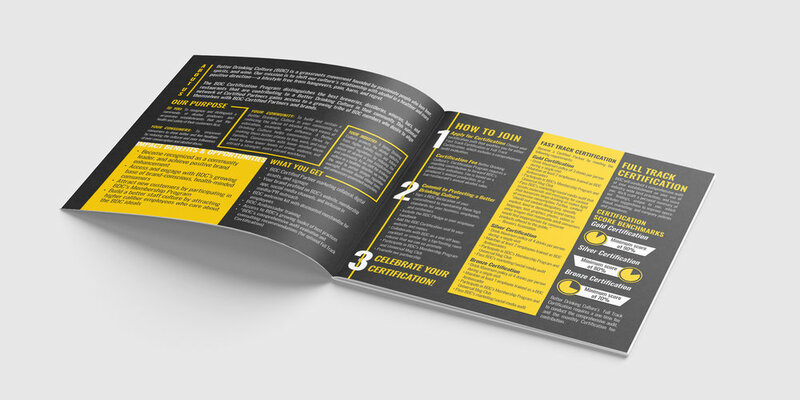 BDC's Certification Program requires a one-time contribution for each Ambassador trained, to cover training resources and welcome kit materials. Discounted rates available for BDC training more than one Ambassador at a time. Ambassador training applies to Full Track and Fast Track Certification. For Full Track Certification Partners only, there is one-time, up-front fee for BDC to conduct our comprehensive audit and evaluation.